26", 22", 18", 14", 10"
We used a dowel of 1/4" diameter. The thickness of the dowel is your choice, but it must fit through the main post and it must be strong enough to hold your stockings when they are full. 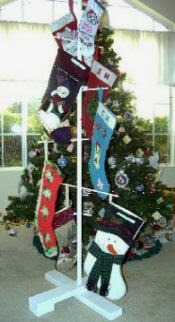 If your stockings will be heavy, you may want to use larger dowels for the branches, a larger trunk, and slightly larger base. One wood dowel of 1" diameter, cut to about 68" length. Cut a 2" x 4" board into two sections that each measure about 2 feet. Cut two more squares from the 2" x 4" board that measure 4" x 4". 1. Measure down about 6" from the top of the trunk and mark the spot with a pencil. 2. Measure 24" from the bottom of the trunk and mark the spot with a pencil. 3. Measure the distance from your top mark to your bottom mark and divide by four. At equal distances from one another (which is the number you got by dividing by 4), make three marks between the top and bottom mark. 4. Your shortest branch will be at the top, and each branch down gets longer. Your longest branch will be on the bottom of the trunk. Drill a hole for each branch, drilling each hole PERPENDICULAR to the one before it. Hole should be a size that creates a tight fit for the dowel. We drilled each hole to 1/4" and then sanded the dowel just enough so it would fit through tightly. 5. Push your branch through the hole. 1. Glue or nail the two base squares onto the underside of one of your base cross pieces, even with the ends, to serve as "feet". (refer to photo). 2. Glue or nail the two base cross pieces together, with the piece with feet on top, and with the two pieces perpendicular to one another. 3. Drill a hole into the center of one of your base pieces, large enough to accomodate your trunk. 4. Glue or nail your trunk into the base. NOTE: You can change the dimensions of your tree, but be sure that the base is large enough to accomodate the tree when fully loaded. If your base is not wide enough, your tree will tip over!